Geographically poised between China and Japan, Korea has played both a linking and influential role as a stronghold of Buddhist culture in East Asia that can be seen in the artworks of all three countries. These countries have a long history of devotion to Buddhism, and until the arrival of communism in the region, many artworks referenced Buddhist practices. Buddhist art in Korea has a particularly feminine flavor. The strict Confucian rule of the Chosun Dynasty (1392–1897) was antagonistic to women, who sought refuge in monasteries. Although Buddhist art was officially banned during that period, Koreans continued to commission Buddhist works. Celadons, a type of pottery derived from China and refined in Korea, are the Koreans’ masterpiece. Korean potters invented the potter’s wheel and developed their own aesthetics, which then became influential in Japan. The perfection of the celadon peaked during the Koryo dynasty (918-1392); through their simple shape but distinctive blue-green glaze, they became most prestigious. The true color of the glaze is similar to that when one looks into cracked ice, described Sebastian Izzard of Sebastian Izzard Asian Art, LLC. A lot of missionaries went to Korea and came back with celadons as gifts. Korean artists also took Chinese landscape painting and added their own style. They focused on depth rather than confining the attention to the foreground. A common theme in the nation’s art is the tiger, which represents vigor and chivalry. The influence of Korean art on the Japanese can be a sensitive topic, especially when pieces of national pride for the Japanese are attributable to Koreans. Japan colonized the Korean peninsula from 1910 to 1945, and Koreans were often treated with condescension. 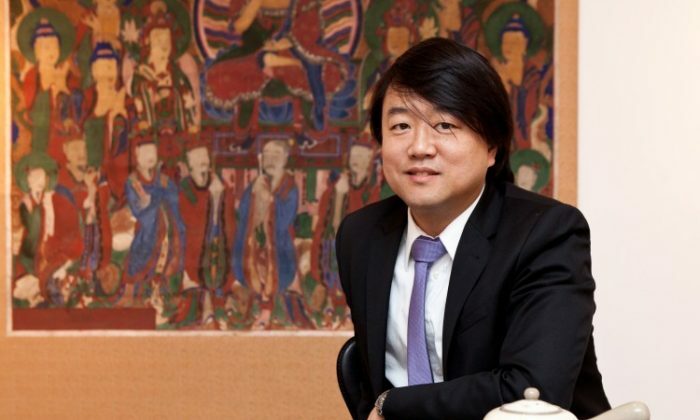 Peter Kang, assistant director of Kang Collection Korean Art on Manhattan’s Upper East Side, learned to appreciate his ancestral heritage through the influence of his mother, a pioneer of Korean art collecting in New York. Keum Ja Kang came to the United States in 1963 on assignment for a Korean publication as a photojournalist. She never went home. Instead, she settled in New York and got a master’s degree in Asian art history at Columbia University. In 1978, when Kang was 12, his mother brought together the first collection of Korean art in a New York gallery. Three years later, the Metropolitan Museum of Art displayed a collection of 5,000 years of Korean art, sparking interest in his mother’s gallery and an appreciation of Korean art in New York City. Maybe “gallery” isn’t the right word, Kang corrected himself. Centuries-old chests were stacked up in their living room, a treasure trove of hide-and-seek spots for him and his brother—though the history and artistry of the pieces were lost on the young Kang at the time. “Koreans are not perfectionists like the Chinese. It’s those imperfections that make Korean art what it is,” said Kang. He poured some green tea out of a white ceramic pot and gestured to stoneware urns at the two far corners of his gallery. In the unpolished nature of the pieces, Kang says, “You can see the human touch, the human hand,” invoking the mystique of the ceremonial urns, of a funerary ritual thousands of years ago, ancient hands placing the pieces at a burial site.